I noticed something the other night as my kids were watching Thor. Every time they show the crystal bridge leading to the Bifrost chamber, it's got flowing water underneath it. The water flows right up to the edge of where the chamber is and then falls off into the void of stars beneath Asgard. There is no part of the bridge that ISN'T over water. At the end of the film, Thor and Loki are fighting on the crystal bridge, and it appears that they're a good distance from the Bifrost chamber - probably 30, 40 feet or more. However, when Thor starts smashing the bridge and Loki falls off one side, he's suddenly hanging above the starry void and NOT flowing water. Is this a continuity snafu within the film or did I miss something? How did that portion of bridge get the void under it and not water? Loki fell off into the Sea of Space, an area off the edge of the city of Asgard. That region lies between the Nine Worlds. Asgard is surrounded by water. Multiple shots establish this. It is magical water because it flows off of the surface of the realm in a grand waterfall. Since the Asgardians do not worry about running out of water, it must be magically or technologically restored somehow. 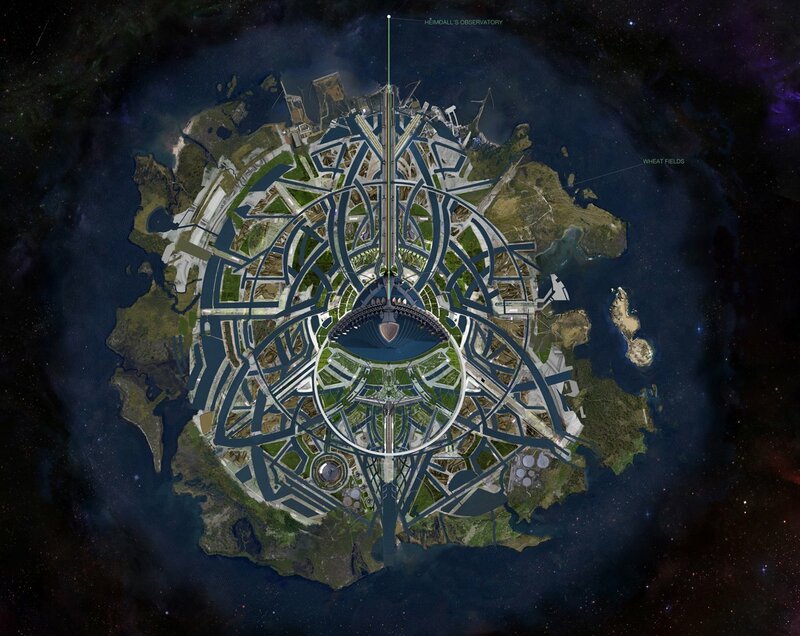 You can see the Bifrost running through the center of Asgard, below. 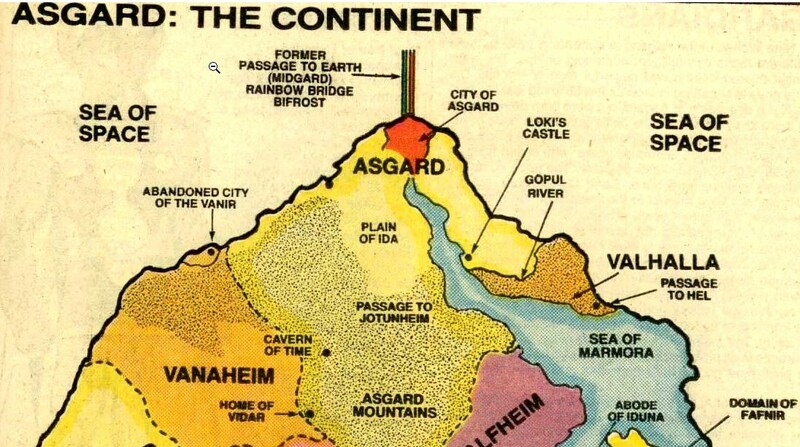 We do know that the Bifrost Projector sits at the very edge of the realm where the waterfall gives way to the Sea of Space (as it is called on early Marvel Maps of Asgard). A more up to date map used in the development of the 3D imagery for the Thor movies, places Heimdall's observatory at the very edge of the water surrounding Asgard. When Thor breaks the Bifrost, they are right outside of the observatory already effectively at the edge of Asgard. The loss of the bridge which sustained the observatory cause the observatory and the ground beneath it to tumble into the Sea of Space (the void around Asgard). It isn't a vary great distance and external shots of the Observatory show the edge of the realm is right underneath it. This final shot confirms what we suspect, that the area Loki fell off of was over the Sea of Space. Water, until you reach the edge of Asgard, and then there's space or void or some sort of nothing. A good chunk of land then falls into the void, including the Bifrost device and the island it was on. This moved the edge of the 'land' beneath the water to be further inland, which then set things up so Loki could fall from that spot into the void. You can see this by looking at the area from above. The water falls away in a concave arc, instead of the convex arc you'd expect from the rim of Asgard. Not the answer you're looking for? Browse other questions tagged marvel-cinematic-universe marvel thor-marvel or ask your own question. Why didn't the Bifrost Bridge connect to Scandinavia? Why couldn't Bifröst Bridge be constructed again? How does Hulk carry both Mjölnir and Thor? Did the Asgardians need the Tesseract to rebuild the Bifrost Bridge? Can Bifrost Bridge be operated without Heimdall? How was Bifrost Bridge shattered in Ragnarok? What's the bandwidth of the Bifrost Bridge? How would the Jotuns have made war on Asgard? What happened to Loki after he fell from the bridge in Asgard (Thor, 2011)?